Cross-Channel Marketing Strategies for Understanding and Engaging Your Customer Across all Touchpoints. Are you marketing in the now? Sounds New Age, but it’s what consumers expect of the brands they love. Marketers are constantly seeking the perfect time and place to reach their customers, yet they keep coming up against the same hurdle: each customer has a different perfect time and channel, and it’s continuously changing. Watch this On-Demand Webinar now to learn how to upgrade your marketing campaigns to meet escalating consumer expectations. To succeed in today's rapidly evolving marketing landscape, you need to understand how to collect, analyze, and leverage the massive and varied amount of data available. A system of data analysis, usable by data novices and ninjas alike, can unlock your campaigns’ performance potential. Join StrongView’s Senior Strategist, Catherine Magoffin, as she lays out a step-by-step, soup to nuts process for marketing data analysis, focused on campaign performance. 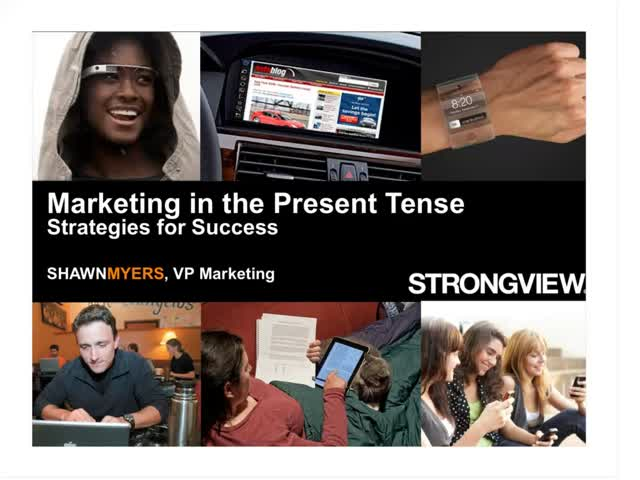 Present Tense Marketing focuses on understanding your customers' current context in order to provide personalized engagements that meet their needs real-time. Visit www.strongview.com/presenttensemarketing to learn more. StrongView offers cross-channel and email marketing solutions for data driven marketers. At StrongView, we love helping marketers connect with customers in meaningful and profitable ways using a combination of email, mobile, social, web and display digital channels and expert services. On our BrightTalk Channel, we will provide strategic and tactical advice on how to improve marketing effectiveness by applying data driven strategies to the aforementioned digital channels.